WTF is that semi-circular thingamajig immediately abaft the yoke on the Kommissar's yoke? Is it a ground-steering tiller? I've got a funny story to tell about my first trip as a pax on one of those screaming imitations of a VC-10 during the darkest days of the Cold War. I'll write it up later but right now I've a got a potentially wonky foal birth to attend to. Taken on a Saturday night. SR had a daily ZRH-MAN operated by a Caravelle. On a Saturday the Caravelle was replaced by a Coronado and the idea was to break and retain the flight time record. They used to get many "directs" and a straight in to rwy 24 as #1. it was always a spectacular quite high speed landing and once the word got out the spectator terraces (remember them) were packed. It's the first layout of the then new terminal, photo taken from the top of the international pier stand 2 or stand 4. The 990s had strange turbofan engines with the fan at the back end of the engine. Ok so I was right the first time then. On par with the VC10? There you go what did I say. Miscalibrated Machmeter! Error of parallax on the Captain's part perhaps! Obviously Caco! .98 on a wing sweep like that? Even his onboard Mach tuck trimmer would have a hard time believing it! From memory, the singing group Bee Gees had an 880. It was parked at KISP for several years iirc. Answering my own question, one website claims it was a Boeing 720. Good Morning Ladies and Gentlemen welcome aboard High Speed One to New Yorkie. Our approximate flight time will be two minutes. We will shortly be pushing back and then a short taxy to the runway in use here at London Heathrow. Please secure your full seat harnesses hang onto your hats and I will see you on the ground. We had a shorter fuselage than the civil version and I think, not sure, higher performance engines. Anyone know? This demonstration high speed run was if I remember rightly, it was a long time ago, to demontrate control reversal approaching Mach1. Would this be correct all you experts out there? The DC9-30 was essentially an airborne Harley and a petrolhead magnet. It was a modest .82 machine but extremely flexible especially on approach and at any weight during day VMC only (obviously). It was a treat when ATC said to expedite approach! 1. Position approx 13 miles level 3000. Bleed off speed to arr 300kt at 10 miles idle thrust. 2. At 10nm / G/S int immediately pull full speed brake. 3. At 280kt pull the slats. 4. At 270kt pull the gear. 5. At 250kt start pulling the flaps in sequential VFE order. 6. At 160kt (roughly 800') retract speedbrake. Start spooling up. 7. 500 ft stabilised. Spooled. Landing checklist. The greater the headwind the easier it was. If a tailwind it was particularly challenging if greater than ten knots. We tended to stick to .81 but occasionally pushed it to .84 if running late or beating the wx (or Ansett's Electra into Hobart) in. The elevator design was a tad weird but explaination can be held off for another time. Note: the srs 30 slat was a long continuous unsegmented piece of tin on each wing. Caco mentioned 'Conman Andrews'. Ah! He was a USAmerican 'businessman' conman/crook called Coleman Andrews who became CEO of SAA in about 1998 (from memory) and looted the country (via the airline) for hundreds of millions of Rand in various ways. He brought in a 'consultancy' called Bains, which he failed to declare as his own company, and had an army of 'consultants' sitting around drinking lattes and talking 'consultant speak' whilst earning fat salaries. He was involved in, and no doubt receiving good kickbacks from, a leaseback scheme for some of the airline's fleet. He may in some ways have been the beginning of the end of SAA. When he left he was handed a couple of hundred million to leave. An investigative journalist called Dennis Becket who hosted a TV programme called Becket's Trek wrote a book about the saga, entitled Jet Lag. It had a beautiful electric blue cover, I had a copy and if I can find it, I know that someone who will read this and whom I am seeing next Sunday would probably like to borrow it. I may have lent it someone and not got it back, the fate of many of my more interesting books. An interesting saga about the destruction of a once good airline. It would have happened anyway sooner or later, but Conman Andrews hastened it. Sits next to Andrew Feinstein's 'After the Party' on my book shelf. All was, sadly, exactly as you say Capetonian. I know all this to be true, but ever the sea lawyer with a big grin on my dial, I was arguing on the basis of scheduled, commercial airliners, not least because I enjoy joshing you, as you well know, Ex-Ascot. As for the military specification VC10, I will pull out Lance Cole's excellent book on the subject and post the relevant gen. here presently. I flew to France earlier this year, in my little spamcan, with a young guy who is a first officer on a US registered Gulfstream G650 who regaled me with stories of cruising at Mach 0.92 at +FL470 over Arizona. Of course all this is very well and good but, as you said EX-A, at that kind of speed perfomance limit the range is impacted although the Gulfstream is phenomenal with a cruise window from Mach 0.85 to 0.90 giving a range of +-7000 nautical miles in that speed range. I did mention to him that all this tripping the light fantastic at FL450 and above is all very well but one must beware and remember what happened to Pinnacle Airlines Flight 3701. I was mildly jealous I suppose. May ask for one of those for Christmas Caco. Incredible aircraft. When carrying members of The Firm, what was the in flight catering like? Out of LHR 1st class BA was used. The cabin supervisor who was in charge of ordering weeks in advance often asked for special items. On the flight deck we got the same. Abroad the best we could obtain. If in some *sh*t* hole we would cater from a hotel. Can the last person to leave,please feed the cat. Flying the 320 in turbulence was fun but an inconvenience at times as it often woke one up from a nice sound nap. The 727 was definitely not a high altitude aircraft, the engines were not powerful enough which left you staggering for height if you pushed it too far. This was probably a good thing otherwise "know nuthin bozos" would have been flying above it's safe limits. The high mach/ low airspeed corner was a very sticky place to be as a certain TWA pilot proved. The 27 did excel at lower altitudes which is what it was designed to do. Around FL280 was excellent. The 27 was designed in days when fuel was cheap and airline ticket prices were fixed so the only benefits the airlines could really sell were in-flight service and shortest flight time. In the days of lighter air traffic completing flights from San Francisco to Los Angeles nibbling on the high airspeed warning from clean up to slowing for the approach was quite standard. I seem to remember the 727 had an IAS limit of about 420 knots which it would do quite easily. 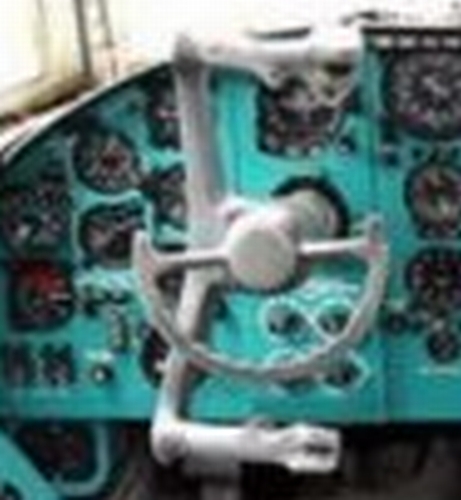 When I first flew in the aeroplane it was as a flight engineer (misused pilot). One night we were in a hurry because we were running late for our layover so the Captain was hustling somewhat. I saw that he was fiddling with the aileron and rudder trim quite a lot. Eventually he turned to me and said "Write up this damn aeroplane for rudder trim - it's two units out of trim in the climb". I felt it would be good to verify the write-up was really what he wanted before I put it in the log-book. "OK Captain, is this what you want me to enter. Aircraft requires two units of rudder trim in the climb at 400 knots?". He thought then said "Perhaps not". the dreamers of the day are dangerous men, for they may act on their dreams with open eyes, to make them possible.